I’m a big fan of podcasts (no surprise!) and when I run or work out at the gym, I usually am listening to something to help while away the time and keep me motivated. Though some people might argue that it’s better to be fully engaged with an activity and not listen to anything, the truth is that it helps me to pass the time (especially on a 3+ hour run!!!). It also makes me feel productive because I’m listening to some great informational podcasts that I’ve queued up on my phone. I bet man you are like me and do the same when you’re exercising, gardening, cooking or cleaning the house. If you’re in my camp and are eager to upgrade whatever it is you’re currently using, you can enter to win these Tarah bluetooth headphones from Jaybird! These have been my go-to headphones for exercise since being introduced to them late last year. They sit securely in my ears. When I run, I only keep one earbud in so that I can hear traffic or people with my “free” ear. But at the gym, where music and people are pumping loudly, I keep both earbuds in. In both circumstances, they fit snuggly and don’t fall out. They also come with a little clip so that when I don’t have the second earbud in, I can clip it to my shirt or bra. The volume and play/pause buttons are easy to use with a control on one side. 1) First, tell me your THREE favorite She’s Bold podcast episodes. Tell me the guest’s name and a brief sentence about what you like about that episode or person. Use this contact form to let me know. 2) For a bonus entry, make sure you subscribe to the She’s Bold Podcast newsletter (sent with the release of each new episode of the She’s Bold Podcast). 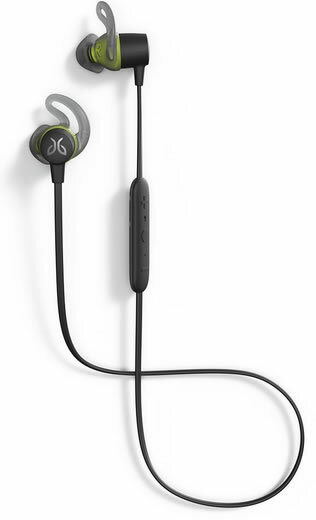 * Approximate value for the Jaybird Tarah headphones is $100! * This contest closes at 11:59 pm PST on March 31, 2019 and the lucky winner will be chosen on April 1, 2019. * I’ll ship to a winner with an address in the U.S. Winner will have three days to reply once being notified. If no response, a new winner will be chosen.